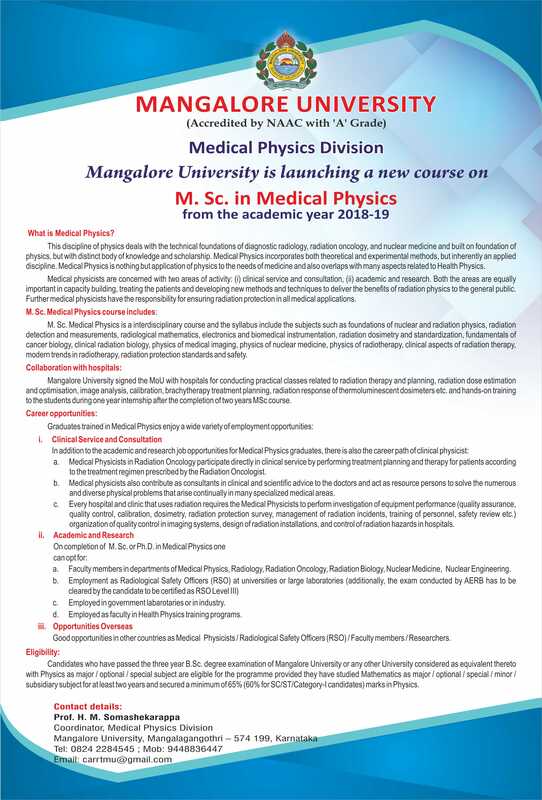 Mangalore University is glad to announce the beginning of a new Masters programme in Medical Physics from this academic year (2018-19). This is course which is first of its kind in any state university in Karnataka. Medical Physics course is approved and recognised by Atomic Energy Regulatory Board (AERB), Government of India. Mr. S. A. Bharadwaj, Chairman of AERB has inaugurated the Medical Physics Division and the course on May 18, 2018. This discipline of physics is responsible for the technical foundations of radiology, radiation oncology, and nuclear medicine and built on foundation of physics, but with distinct body of knowledge and scholarship. Medical Physics incorporates both theoretical and experimental methods, but inherently an applied discipline. Medical Physics is nothing but application of physics to the needs of medicine and also referred as Health Physics. Medical physicists are concerned with two areas of activity: (i) clinical service and consultation, (ii) academic and research. Both the areas are equally important in capacity building, treating the patients and developing new methods and techniques to deliver the benefits of radiation physics to the general public. Further medical physicists have the responsibility for ensuring radiation protection in all medical applications. MSc Medical Physics is an interdisciplinary course and the syllabus include the subjects such as foundations of nuclear and radiation physics, radiation detection measurements, radiological mathematics, electronics and biomedical instrumentation, radiation dosimetry and standardisation, fundamentals of cancer biology, clinical radiation biology, physics of medical imaging, physics of nuclear medicine, physics of radiotherapy, clinical aspects of radiation therapy, modern trends in radiotherapy, radiation protection standards and safety. Mangalore University signed the MoU with medical colleges and hospitals for conducting practical classes related to radiation therapy and planning, radiation dose estimation and optimisation, image analysis, calibration, brachytherapy treatment planning, radiation response of thermoluminescent dosimeters etc. and hands-on-training to the students during one year internship after the completion of two years MSc course. Medical Physicists participate directly in clinical service by performing treatment planning and therapy for patients according to the treatment regimen prescribed by the Radiation Oncologist. Medical physicists can work as consultants in clinical and scientific advice to the doctors and act as resource persons to solve the numerous and diverse physical problems that arise continually in many specialized medical areas. Every hospital and clinic that uses radiation requires the Medical Physicists to perform investigation of equipment perfor­mance (quality assurance, quality control, calibration, dosimetry, radiation protection survey, management of radiation incidents, training of personnel, safety review etc.) organization of quality control in imaging systems, design of radiation installations, and control of radiation hazards in hospitals. Faculty members in departments of Medical Physics, Radiology, Radiation Oncology, Radiation Biology, Nuclear Medicine, Nuclear Engineering. Good opportunities in other countries as Medical Physicists / Radiological Safety Officers (RSO) / Faculty members / Researchers. In addition to the faculty members from Mangalore University oncologists and health physicists form collaborating institutes; scientists from Bhabha Atomic Research Centre (BARC) will be participating in teaching and training the students of this programme. Besides, Mangalore University has also appointed select experts and scientists of national and international repute from different fields as Adjunct Professors to teach the students.